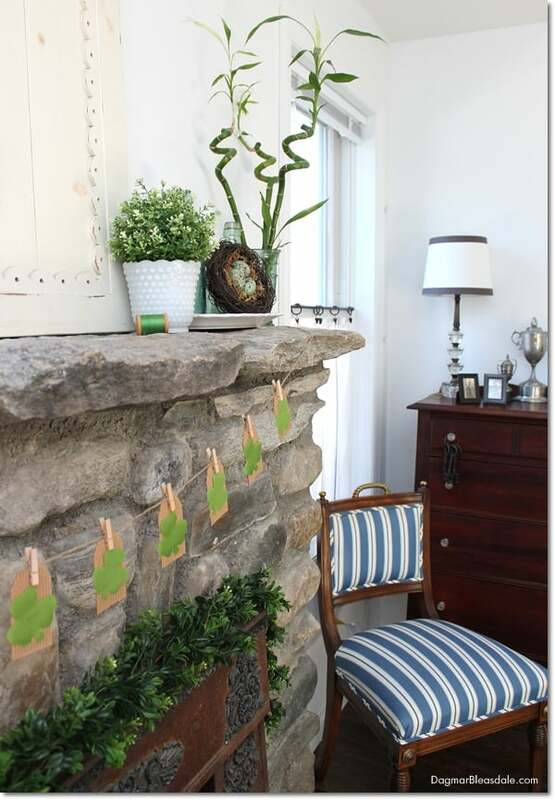 The Blue Cottage is decorated for St. Patrick’s Day! 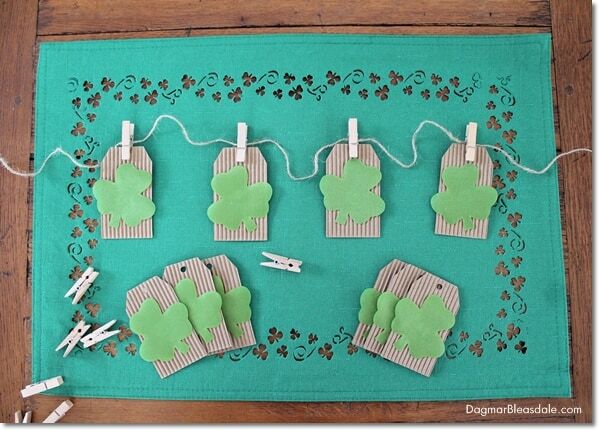 I made this super easy St. Patrick’s Day banner — here is the tutorial. You know me, I don’t pay much for decorations – I usually find inexpensive ones at thrift stores or craft stores, or tag sales. 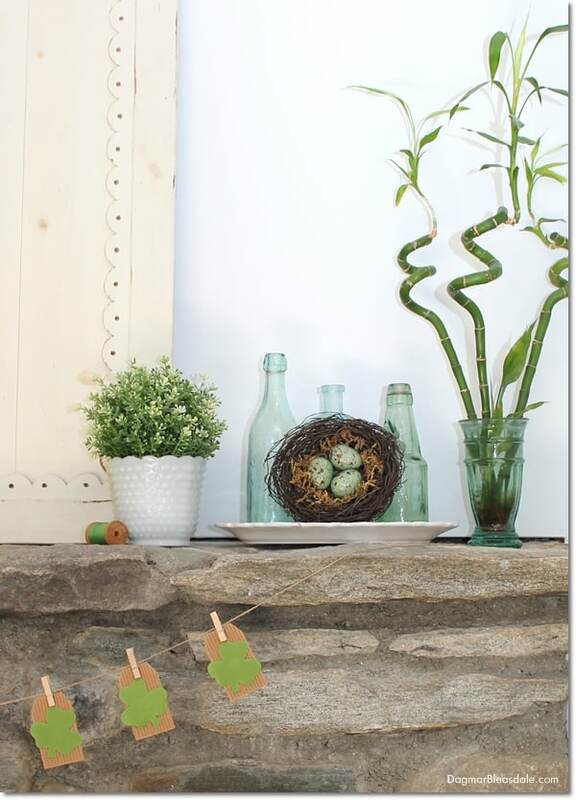 I always have the next holiday in mind and my eye out for decorations for that holiday when I shop. St. Patrick’s Day is Sunday, March 17 this year. I’m loving all of the green in our living room. 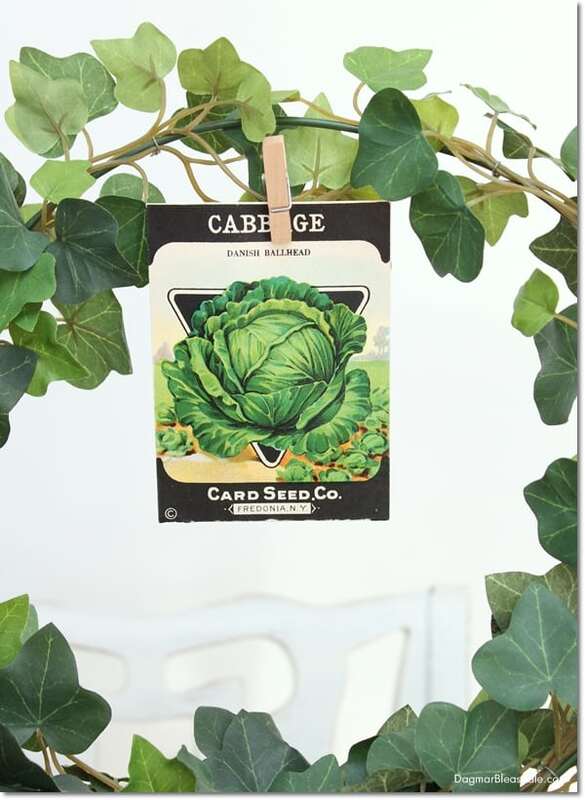 I made this banner with vintage seed packets last year, but I don’t know where it is right now, so I just made a new one. 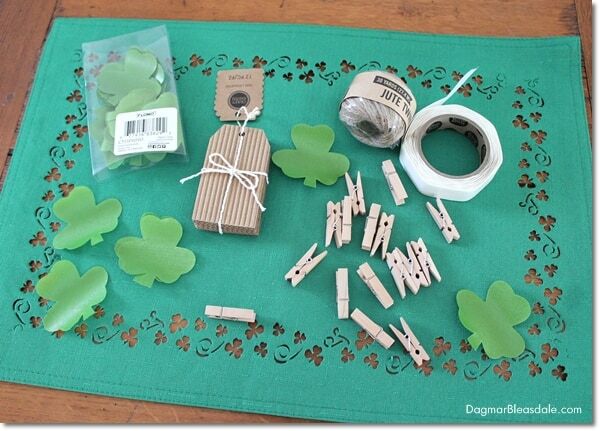 On my last visit to the craft store, I found little shamrocks on sale for $50 cents, and the little corrugated cardboard tags were also half off. I knew they ‘d be perfect for a fast banner. 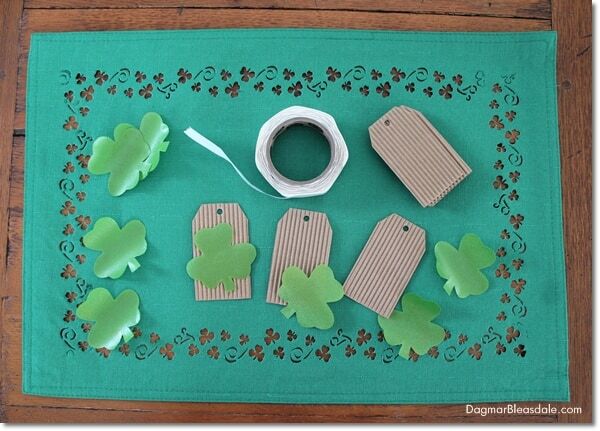 I added one glue dot to the shamrocks and pressed them gently against the cardboard tags. You could obviously also just cut banner pieces in the shape you prefer out of thick cardstock. 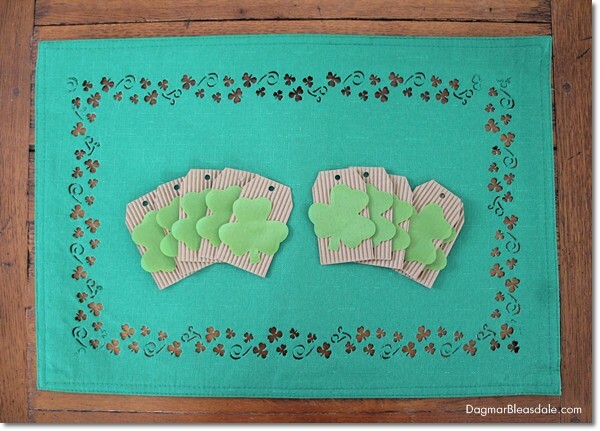 I glued down five shamrocks leaning to the left and five leaning to the right for this banner. After I measured how much twine I’d need to span our fireplace mantel, I started cliping the banner pieces to the twine. Since it’s hard to attach something to the stone top of our mantel, I just put the ends of the twine under the cake stand on one side and the vase on the other, and readjusted the banner pieces until I was happy with it. And this is what the banner looks like on our mantel now. Cute, right? I just noticed that the little green bird is sitting in the same spot as last year. 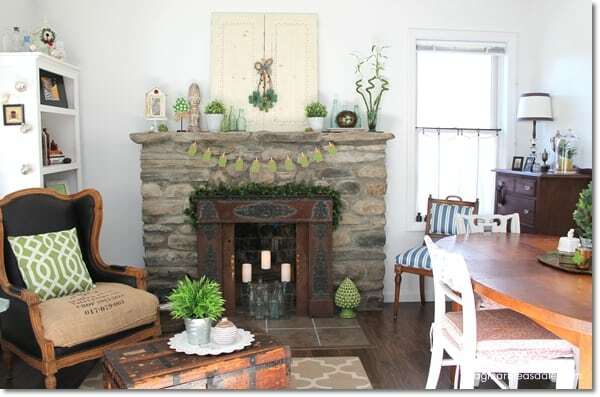 I put together the rest of the decor by grabbing a lot of things I have that are green, like the plants, the dried hydrangea, and the vintage bottles, and added just a few new pieces. 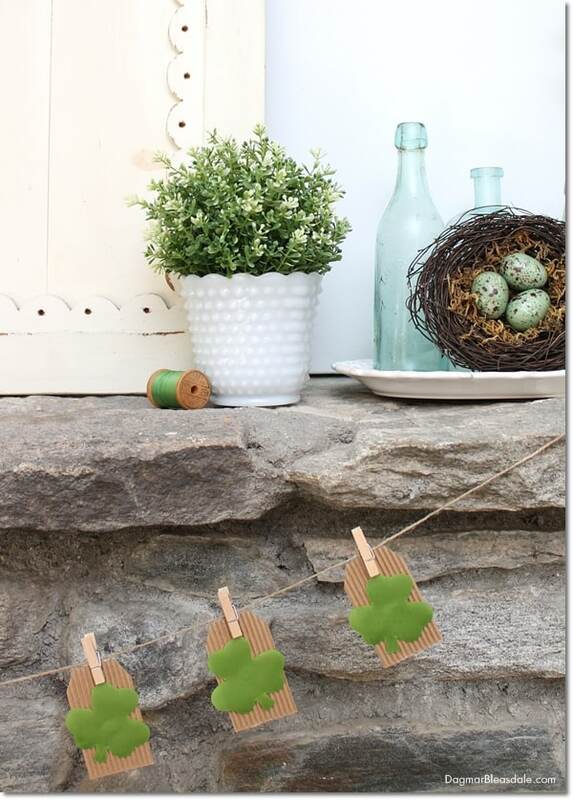 I was looking for St. Patrick’s Day decor the last few weeks, and soon I’ll be concentrating on finding a few new items for spring and Easter decor. 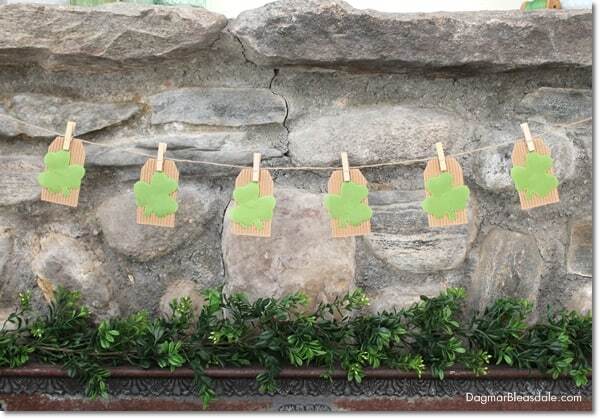 The three shamrock I added to the doors in the center of the mantel cost a few dollars at the Christmas Tree Shops. 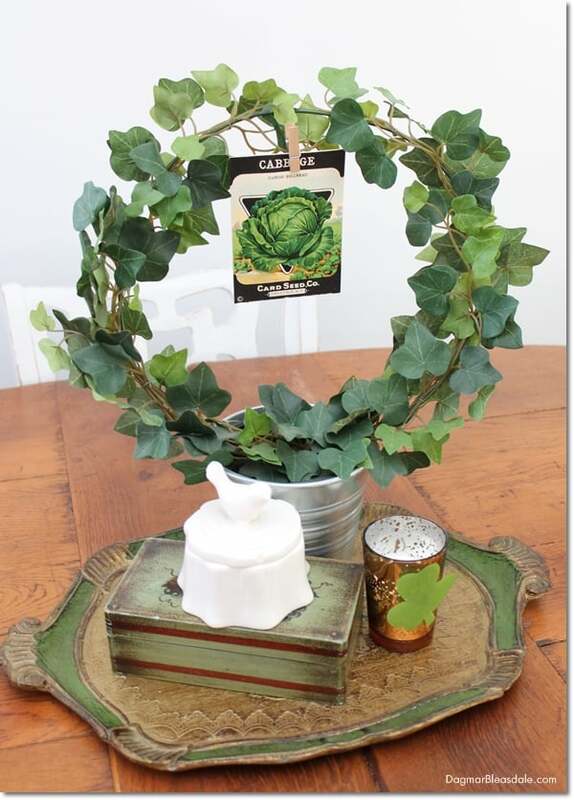 The shamrock with the burlap bow is from the craft store, and the most expensive new item I bought was the green garland around the fireplace frame — that was about $19, but I had a 40% off coupon. It’s tricky to position things on our mantel because it’s not level, but after some rearranging and trying different things, I usually find a look I’m happy with. I’ve had these bamboo plants for years, and their height adds another nice dimension. 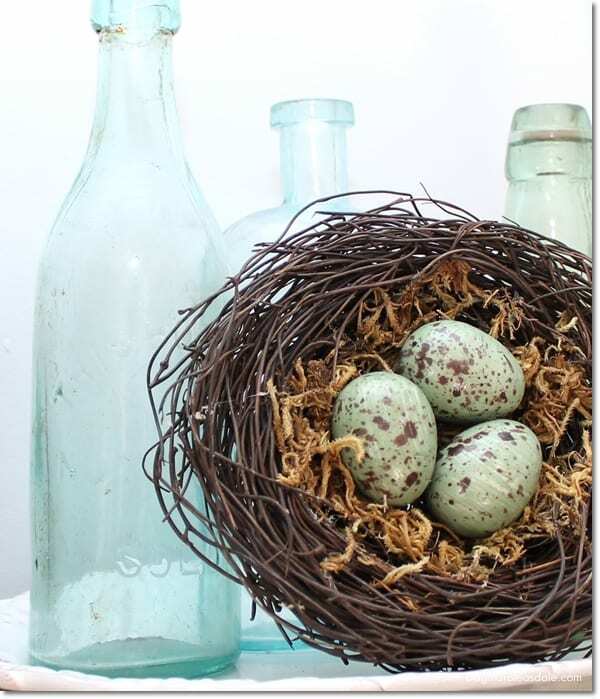 My dear father collected antique bottles, and I have continued that tradition. I always think of him when I see old bottles, and I like decorating with them partly for that reason. It feels unreal that we will have been without him for five years this August. 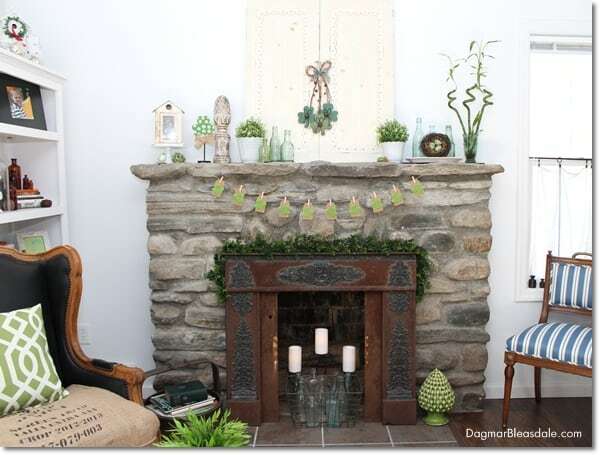 Nests and eggs make me think of my mom, who loves collecting stone eggs, so this mantel decor also makes me think of her. 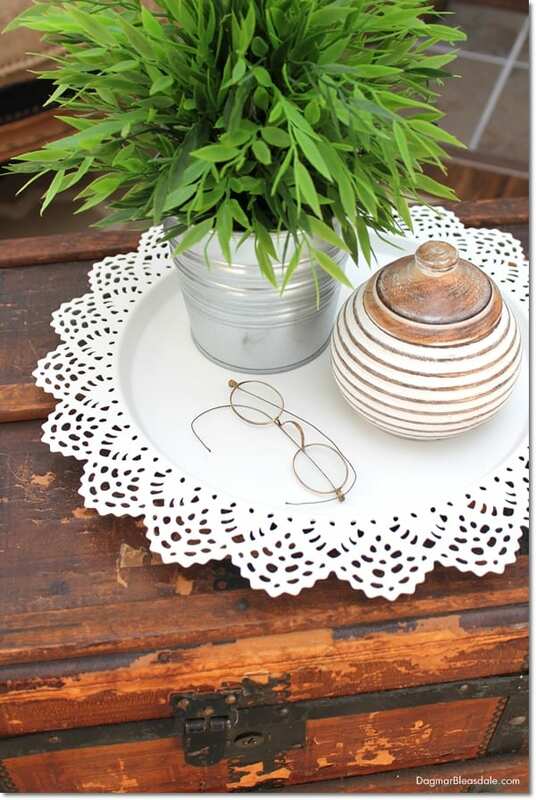 Here you can see how I decorated the table. 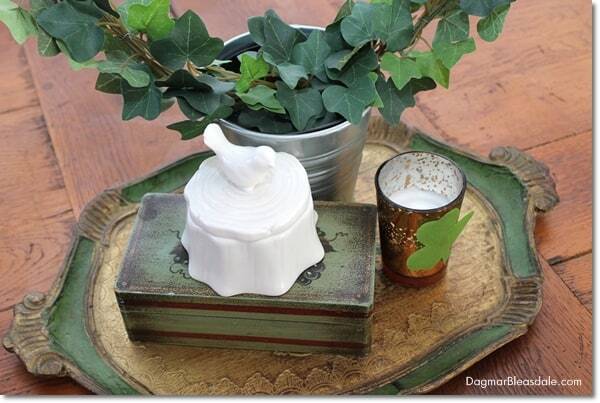 This vintage tray from Italy is a Goodwill find for $3.99, the green box a tag sale find, the bird box was on clearance in a gift store, and the mercury candle was a dollar at Target. 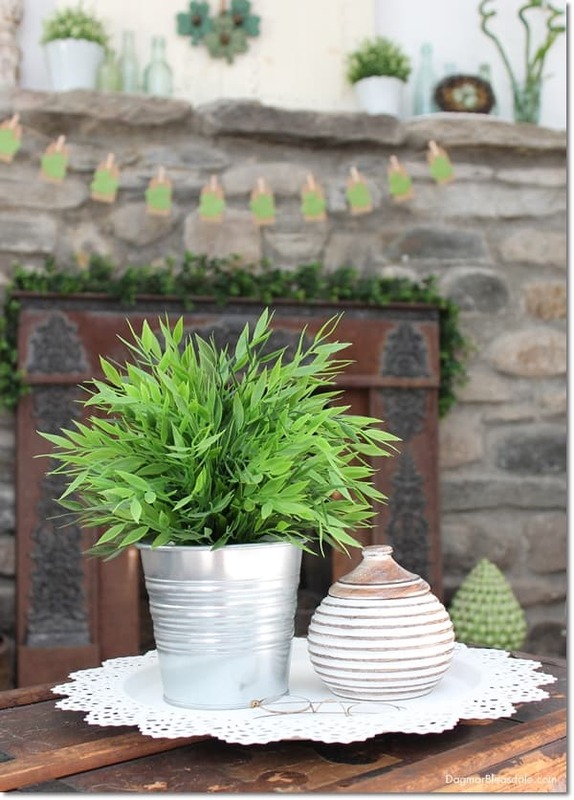 These fake plants and planters are from IKEA, and I have four of them around the house. 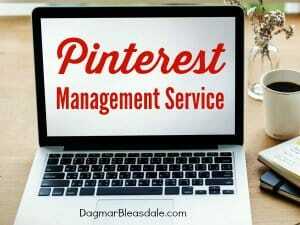 They are inexpensive and come in handy all the time. 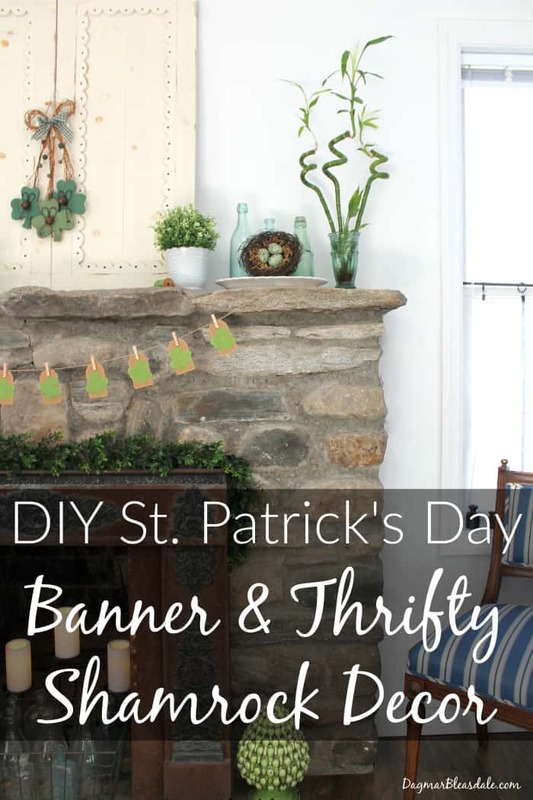 So there you have it: an easy DIY St. Patrick’s Day banner and thrifty shamrock decor that didn’t break the bank and didn’t take long to put together. It’s so easy, your kids can help to make it. So so cute! I love touches of green. 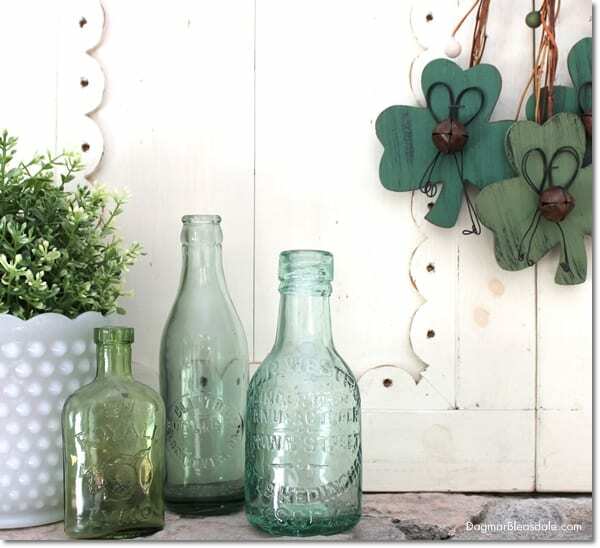 Your vintage green bottles are my favorite! Really like this look. 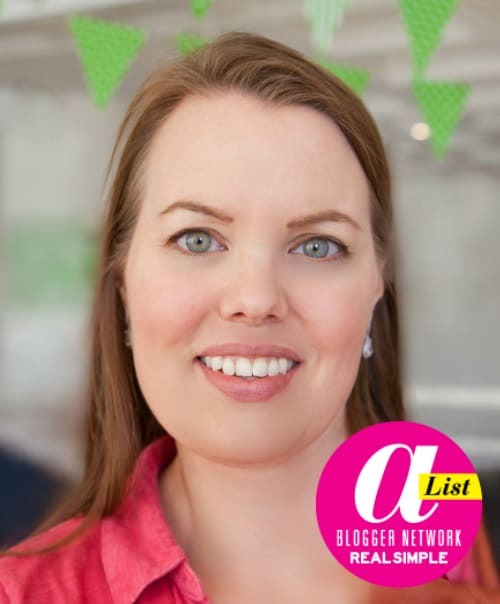 shopping your house for bits and bobs in a specific color is So much more interesting than just going to the craft store and stocking up…that spool of green thread is a cute touch! 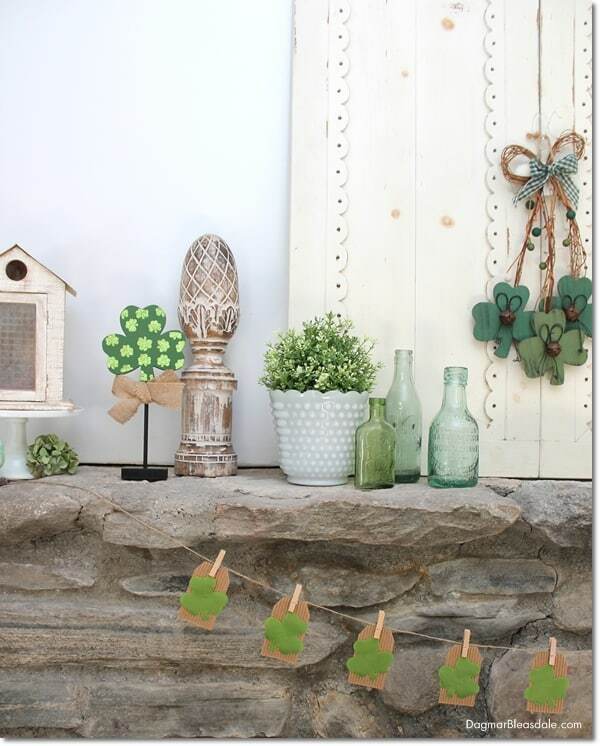 This banner is adorable and perfect for your mantel. 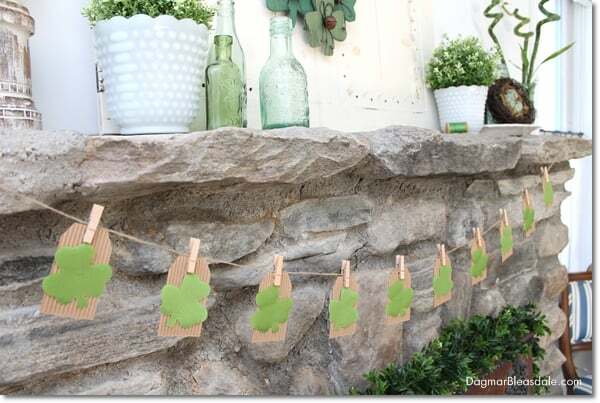 I can’t wait to share this in my DIY St.Patrick’s Day Ideas on the Merry Monday party sunday at 6pm PST. I hope you can join the party. 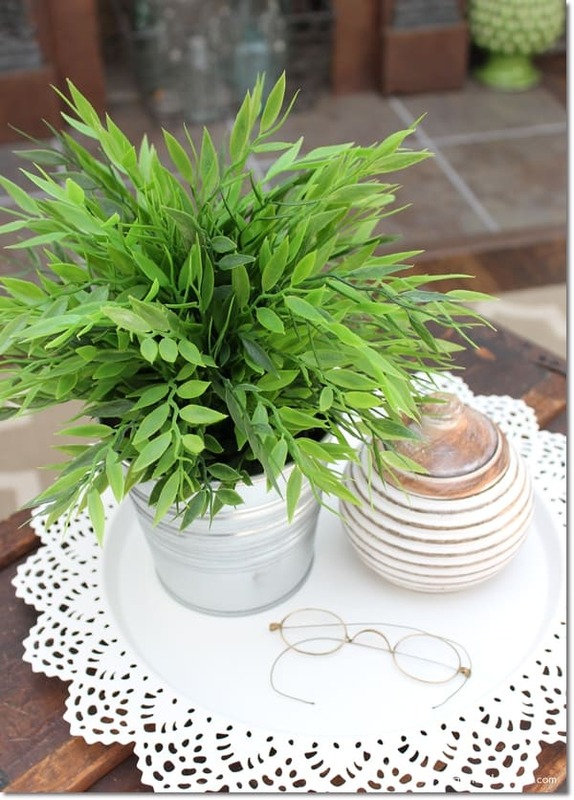 Your home is wonderful and i love all the touches of green! Thank you for your kind comment, Angie! Thanks for coming by, Crystal! 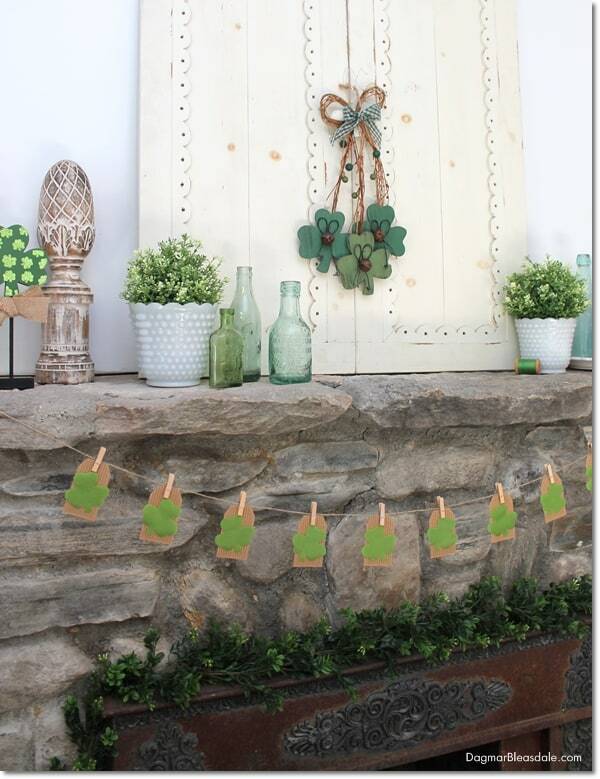 Although St. Patrick’s isn’t one I decorate for, I LOVE seasonal and holiday decorating!! 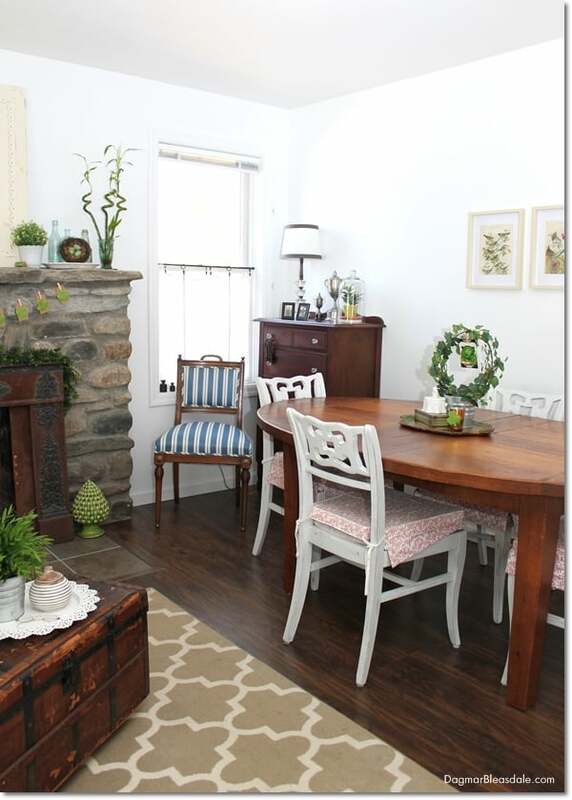 This is so sweet and your home always looks so amazing! 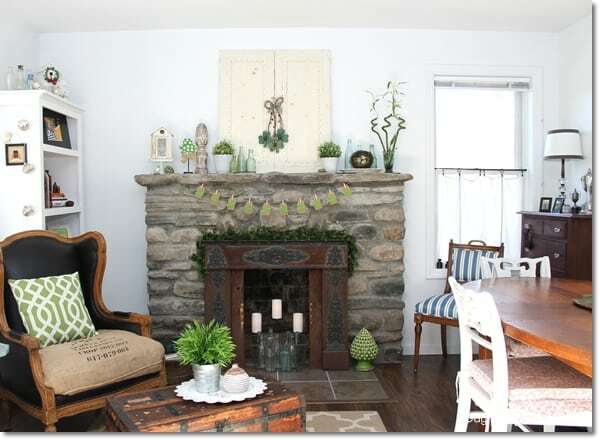 Very cute decor. Thanks for partying with us at Merry Monday. I have never had any luck with the bamboo plants. Yours look healthy. 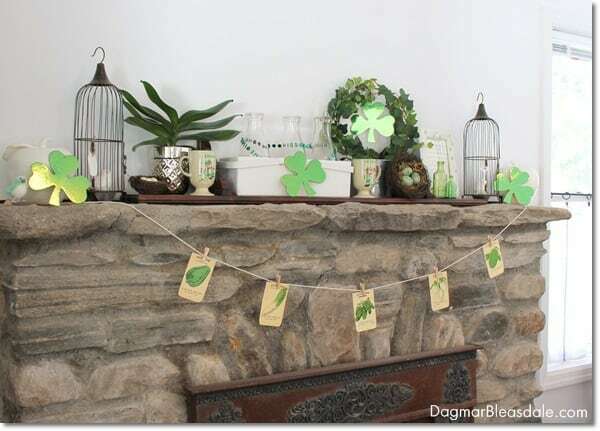 I never decorate for St. Patkrick’s Day but now I’m thinking maybe I should. 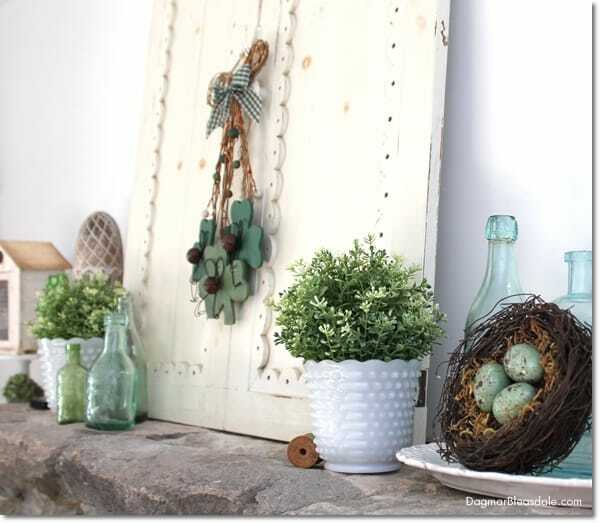 It all looks great and all of the green is perfect for spring too!